Made in Great Britain - using components made in the UK where possible. MADE TO ORDER: drum lampshade created using House of Hackney x William Morris ARTEMIS dove grey stripe fabric inspired by feral gardens. Please state whether table or pendant fitting required when ordering. Many other styles and sizes available in my other listings. If you cant find what youre looking for message me I also make bespoke orders in many other sizes and choices of pattern. Please read all T&Cs before ordering. 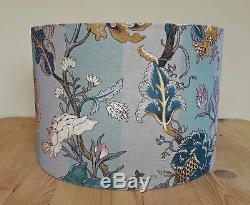 Many mass-produced lampshades are made with thin PVC, liable to creasing, cracking and yellowing over time. The edges have seam tape to secure the PVC to the frame, which invariably cracks and fades over time. The seam on the overlap also tends to have a raw edge. My frames give you a choice! With a removable plastic converter, they can be used on BC or Edison lamp fittings (thats big ones and little ones). 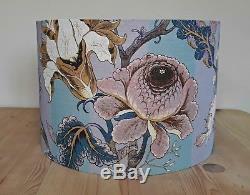 All lampshades are created using PVC engineered especially for lampshade making. As well as being thick and strong to avoid creasing, it is anti-static to avoid the attraction of dust and UV stabilised to prevent yellowing and of course, conforms to British safety regulations. This shade will fit the standard bayonet cap (BC) lamp holder. It can also be used with Edison Screw (E27) lamp holders, most common in Europe, simply remove the converter plug in the centre of the fitting. These are all handmade so by their nature, no two will be the same (although if you do want identical please ask, I will always do my best to accommodate but it may cost a little more). I always ensure theres a good pattern placement but if you have a specific request, please contact me before you order and Ill let you know if its possible. I make lampshades, drum and other shapes, soft cover as well as cushions, throws, draught excluders, door stops and so on drop me a line for a quote. IS THIS AFFILIATED TO A BRAND? These are handmade items created using branded fabric only they arent endorsed by the brand or branded as such. WHAT DOES MADE TO ORDER MEAN? Because all products are made to order, no two will be identical. It also means they take longer to arrive than off-the-shelf items (so please bear this in mind when ordering). It does means that your item will be unique, made especially for you and to a very high standard. WHEN WILL MY ORDER ARRIVE? CAN I RETURN IT IF I CHANGE MY MIND? Each item is made to order this means the size, fitting and fabric pattern is made up especially for you. Cancellations are also not accepted as fabric is bought especially for each order. WHAT IF THERES A PROBLEM? Occasionally the couriers get it wrong and although I use sturdy brand new double walled boxes and recyclable packing materials where possible sometimes a lampshade will get damaged. If this does happen dont worry contact me through messages, send me a photo of the damage (whole item, close-up too, and the packaging) and Ill get a replacement to you ASAP. WHERE DONT YOU DELIVER TO? The item "House of Hackney x William Morris ARTEMIS grey stripe floral drum lampshade 40cm" is in sale since Tuesday, May 15, 2018. This item is in the category "Home, Furniture & DIY\Lighting\Lampshades & Lightshades". The seller is "loulouthomas" and is located in Shropshire. This item can be shipped to United Kingdom, Austria, Belgium, Bulgaria, Croatia, Cyprus, Czech republic, Denmark, Estonia, Finland, France, Germany, Greece, Hungary, Ireland, Italy, Latvia, Lithuania, Luxembourg, Malta, Netherlands, Poland, Portugal, Romania, Slovakia, Slovenia, Spain, Sweden, Australia, United States, Russian federation, Canada, Brazil, Japan, New Zealand, China, Israel, Hong Kong, Norway, Indonesia, Malaysia, Mexico, Singapore, South Korea, Switzerland, Taiwan, Thailand, Chile.